Ethlyn’s Caribbean Bakery (1621 Nostrand Ave, Brooklyn, NY 11226) is in the heart of the Flatbush neighborhood on Nostrand Ave., which is the center of NYC’s Caribbean community. What is great about Flatbush is they have food from pretty much every country in the Caribbean, and while bigger countries like Trinidad and Jamaica are handsomely represented, so are the smaller countries like St. Vincent, which only has a population of 100,000. One of our longstanding policies is that there is no better way to experience a country than through their bakeries, so we were excited to experience some of the more unique tastes of the Caribbean at Ethlyn’s. Ethlyn’s is nothing more than a small glass counter filled with pastries and breads, both sweet and savory. Everything was super reasonably priced, and each item was no more than $3-5. We got a bright red salara coconut roll, and a currant roll. The salara, which is popular in St. Vincent (but can be found in other Caribbean nations), was a super-sweet enriched roll that fell somewhere between a bread and a cake, and was chocablock with coconut. The currant roll, which is found throughout the Caribbean, was a little more sedate. Both were tasty, though the salara did somehow manage to leave red crumbs all over, which we were still finding months later. On the savory side, we also got a saltcod patty which was touted as one of Ethlyn’s specialties. To be honest, we are more fans of the sweet treats, but if you wanted to have a savory fish patty for a light lunch, it is a good one. Other treats available at Ethlyn’s bakery include a coconut tart, peanut cake, marble cake, loaves of bread and dinner rolls. To wash down your treats, Ethlyn’s makes a mean sorrel drink, along with the more exotic soursop and sea-moss varieties. Ethlyn’s was a real taste of the islands, and it was a fun way to explore the Caribbean side of Flatbush. Plus, it is right next to a costume design shop for Carnival. What could be better?! As you can tell from our blog, we are big on sweets so we decided to keep the momentum going with a Chicago-area Romanian find. Ovy Bakery (3455A W Dempster, Skokie, IL) is so unassuming, if you blink you’ll miss it for two reasons: 1. it is located in a completely nondescript strip mall and 2. there is a big sign reading “La Patisserie” outside from the bakery’s former incarnation. I only noticed Ovy because I was intrigued by the “Transylvanian” sign in the window – not a common sight. Ovy Bakery is small, and when we visited it was pretty crowded! There were 2 sections of pastries in the glass case: traditional Romanian and more modern French-inspired creations. Chef Ovidiu Pop, the eponymous “Ovy,” who is of Romanian extraction, honed his pastry skills by working at Blackbird and the Peninsula Hotel in Chicago, which explains the mashup of Romanian and other European styles. Amandine – This is one for the rum lovers – a chocolate covered chocolate cake that had been soaked in rum. beware – it is very strong. Honey Cake (seen at the bottom of the page) – This was similar to the Dobos torte in appearance, and featured delicate layers of honey cake, pastry cream and apricot jam. It had a faint graham cracker flavor, which was both delicious. Creme – This dessert looked simple, but had a very unique taste – it was puff pastry filled with a vanilla cream that tasted more like a gelatinous zabaglione than pastry cream. Though the texture was a bit unusual, it was still very good! From the modern side we sampled a Passion Fruit Mousse on a cookie base, which was exquisitely presented, and tasted even better. D’Amato’s (1124 W Grand Ave., Chicago, IL) is the type of place that hasn’t changed in decades. 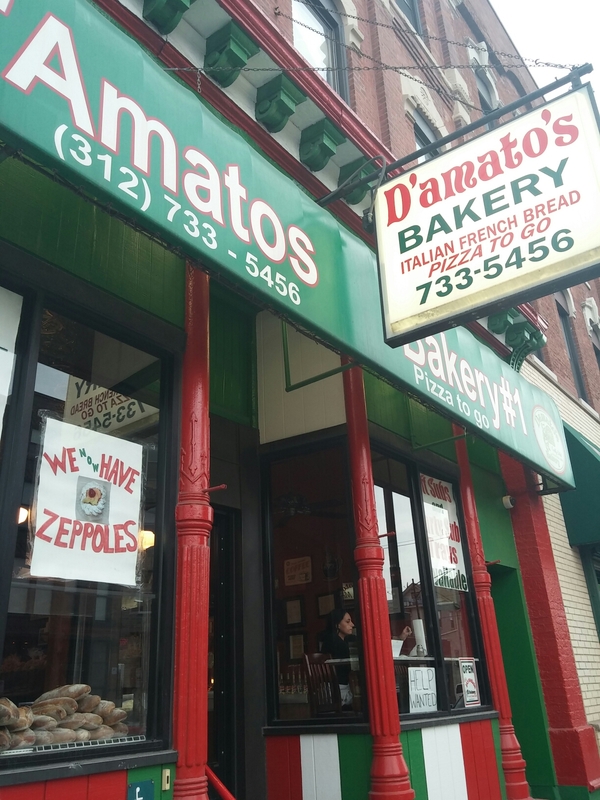 Like Bari, D’Amato’s is carrying on the tradition of the old Italian enclave that once existed (and now exists in pockets) on West Grand Avenue in Chicago. Carrying it one step further, this cash-only place has a ornate, copper cash register from the 1920s. We tried to get a video of it in action, but we were so mesmerized that we couldn’t even get a proper shot. However, go take a look for yourself, we know you will be mesmerized too. 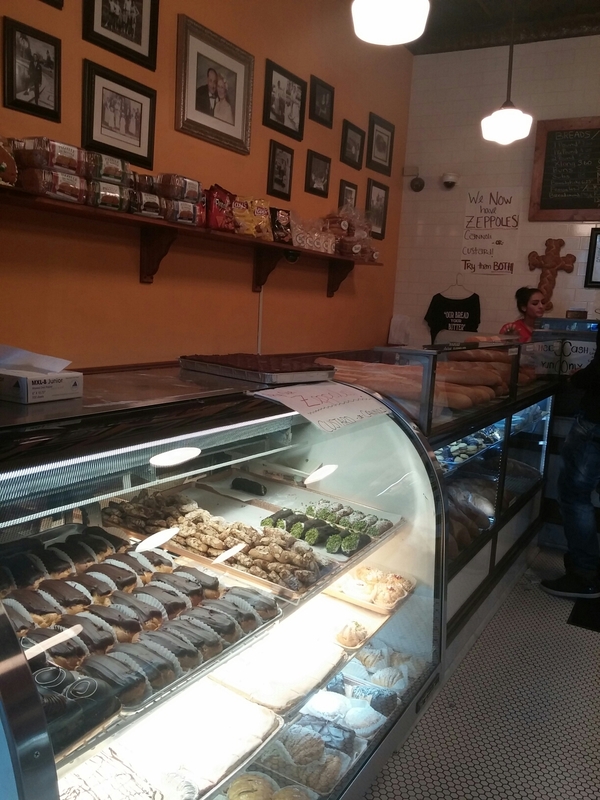 The stock in trade at D’Amato’s is classic Italian American baked goods and thick squares of coal-fired Sicilian pizza. They are known for their cannolis – you can even get a giant cannoli filled with miniature cannolis, one of our favorite things in existence. For Lent, they also are famous for their zeppole, the Sicilian fried doughnuts, which were superlative. We also tried another assortment of Italian treats including sfogliatelle and chocolate dipped cookies. 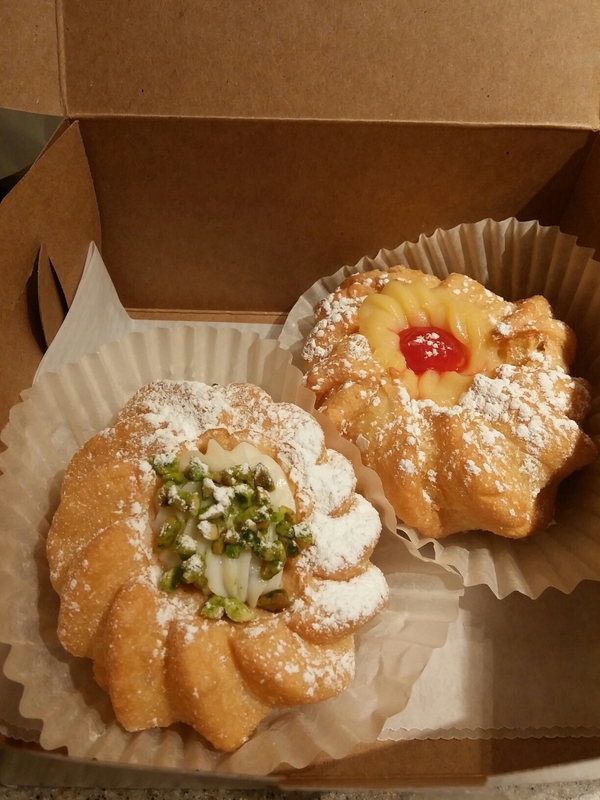 Everything was tasty but the zeppole were standouts, and we really look forward to trying their Sicilian pizza! Everyone has been buzzing about Baker Miller (4610 N. Western Ave.), and the fact that they mill their own flour, adding yet another layer of artisan to the artisanal bakery. Everyone is especially buzzing about their bread and toast bar – there are even toasters available at every table to toast it up yourself. So when we visited on Saturday, we were a little disappointed to see the power was out (and therefore the toasters, too) – not their fault – it affected the whole block. But luckily for us that meant they were having a fire sale on cinnamon rolls – 2 for 1 at (normal price $3.50). The cinnamon rolls were huge – so this is a really good bargain. We decided to split one in the store and take one home for later. On appearance alone, we were delighted – but the taste was even better – this was a darned good cinnamon roll! The roll, which was actually an earthy sourdough, had a good cinnamon flavor, and was not covered in a gross sticky glaze that I hate, like at some other venues. The “raw sugar” frosting was also particularly fresh, and not overpoweringly sweet. This was a restrained cinnamon roll – and we liked it. You can even take some rolls to bake at home yourself. After our excellent cinnamon roll experience, we can’t wait to visit Baker Miller again when they have power. If you do not know where to look, there is absolutely no way that you would find Hendrickx Belgian Bread Crafter by chance (100 E Walton St.). It is located half of a story up on the ground floor of a large concrete condo high-rise and is mostly hidden from view. The store itself is tiny (though it appears they have a pretty big kitchen) and consists mostly of a small counter and a few tables. However, despite its small size, this place is a serious bakery helmed by Belgian breadmaker Reynaud Hendrickx. Another hint of its authenticity, each time we visited, we were served by a delightful Francophone woman and the place was chock full of Francophone customers. The breads – Belgian country, brioche and challah to name a few – are certainly the main draw, but we were also seeking something a bit sweeter – a purportedly authentic Liège Waffle made with Belgian pearl sugar. We absolutely had to try it! Unfortunately, our trip to Hendrickx came at a somewhat inopportune time – 7 PM. We realized this was certainly not the best time for a bakery at all, and there was only one waffle left! Our lone survivor waffle was very tasty, and we appreciated the signature bursts of caramel-like sweetness from the pearl sugar, though we were a little disappointed that it had not been made fresh. We definitely would have waited a few minutes for a waffle hot off the iron…maybe next time? The croissants are also excellent and come in both plain and more unique flavors like apple turnover and cherry/chocolate ($2.85 for plain, extra for fillings). We were also delighted to find a hearty menu of soups, salads and sandwiches in addition to bread. The particularly generous sandwiches are served on thick slices of the signature homemade Belgian country bread, which makes a HUGE difference, and include such varieties as goat cheese/honey and curried chicken salad (Each $7.25). The “Belgian” salad ($9.25) was similarly fresh, and consisted of a composed plate with arugula, tuna, bread and capers. Our friends also had the soup of the day – split pea – that they greatly enjoyed. Over the course of a few visits we sampled some of their savory offerings, and each time we were impressed by the fresh and simple ingredients. No filler here, and there will surely be leftovers due to the generous portion size. We also like that they wrap up the leftovers in wax paper for you. The first time we visited it was pleasant enough to sit outside, however there was also a little fishbowl-like sitting area, which, curiously, you have to go through the kitchen to access. Overall we highly recommend Hendrickx, and are glad to have found an independent option in the area. Hendrickx is a perfect place to stop for a little lunch before/after a day of shopping in the Gold Coast/Michigan Avenue or after an afternoon at the Museum of Contemporary Art. Every time we go to Wicker Park the landscape is slightly different than the time before, with upscale stores and eateries seeming to carve out a larger footprint each visit. Time marches on, however there are some places that stay the same even though everything around them changes. One of those stalwarts is Artemio’s Bakery, which seems like it is a transplant from another era. Walk in the front door and you will feel like you are in a time warp – the bakery is crammed with wooden cases and the strong aroma of butter and sugar is unmistakable. But don’t worry, in this case a time warp is a good thing, the pastries are old-school and everything is unbelievably cheap! 25 cents for a cookie? Heck – 25 cents for anything?!?! Even in Brazil the smallest piece of candy was usually 50 cents apiece (R$ 1). Cookies at Artemio’s are only 25 cents and larger pastries like croissants or conchas are barely a dollar. The selection is wide (though unlabeled, so you may have to guess or ask), and you can get nearly every kind of Mexican pastry, as well as American classics. 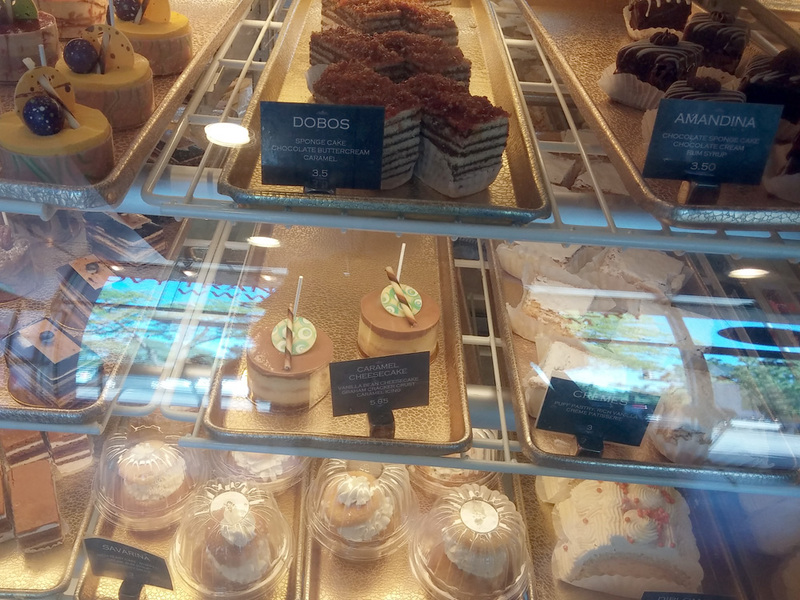 We spotted croissants, cupcakes, coconut macaroons, many types of cookies, tarts, elephant ears, doughnuts, sweet rolls and cakes by the slice including chocolate and tres leches. This time around we ordered several black and white cookies and a giant sugary croissant – both delicious – and they set us back less than $2. As we trailed sugary crumbs down Milwaukee avenue we were satiated and happy. Definitely check out Artemio’s for a cheap sugar fix and for a time warp back to old-school Wicker Park. We were in the Logan Square neighborhood for a concert, and we felt like picking up a sweet treat for later, despite the fact that we already had a pound of carnitas (more on that later). We had heard good things about the Guatelinda Bakery, so we decided to give it a try. Guatelinda Bakery is a corner store in the truest sense of the word, situated directly on the corner, and containing both a baked goods counter and staples like milk and eggs. Along one wall there was a cooler of said staples as well as a well-chosen selection of Guatemalan canned goods and sodas. There is a chalkboard advertising the daily specials, including savories like cornbread and fresh chile rellenos ($3). In the bakery case, as well as along the back wall, are an assortment of about a dozen kinds of pastries, scones, pan dulce, and cookies. We ordered a mini pound cake ($1.50) and a Cartucha ($1.50), a cream-filled fried pastry. The pound cake was buttery and delicious, with a hint of lemon. The cartucha was kind of like an eclair on steroids, but a bit flakier than you might expect, and M the whipped cream-lover was a fan. As we paid, the nice lady manning the counter asked us if we lived nearby, if we did we should come back sometime to try the specials. Too bad we don’t (but you can be sure we’ll visit again, anyway)! Tucked away in a vintage shop in a rapidly gentrifying stretch of Division, Alliance Bakery has been churning out classic cakes, cookies and pastries for over 80 years. The windows are lined with fantastically detailed (and sometimes absurd) custom cakes in the shape of hats, purses and multi-tiered wedding confections. For a smaller bite, the giant cookies are fantastic as are the perfectly-iced cupcakes. Along with a selection of European pastries, Intelligentsia coffee is brewed, and wide selection of bread is ready to take home. On a nice day, outdoor patio seating is prime. Alliance has recently expanded into the storefont next door, making a whole room dedicated to air-conditioned and wi-fi. If you want to people watch, you can nosh in the picture window on pink upholstered chairs, under the watch of the distinctive neon sign.